«My soul sings the greatness of the Lord, and my spirit trembles with joy in God, my savior, because he looked with kindness on the smallness of his servant» (Lk 1,46-48). 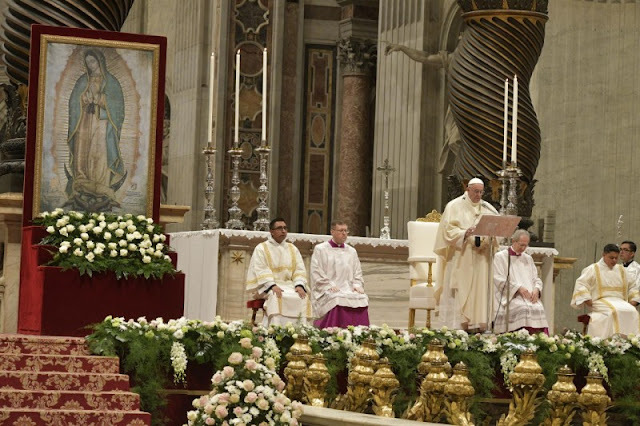 Thus begins the song of the Magnificat and, through him, Mary becomes the first "pedagogue of the Gospel" (CELAM, Puebla, 290): it reminds us of the promises made to our fathers and invites us to sing the mercy of the Lord. Mary teaches us that, in the art of mission and hope, so many words and programs are not necessary, her method is very simple: she walked and sang. This is how the gospel presents us after the announcement of the Angel. Hurry-but not anxious-walked to Elizabeth's house to accompany her in the last stage of pregnancy; hurriedly walked towards Jesus when wine was lacking at the wedding; and already with gray hair over the years, walked to Golgotha ​​to be at the foot of the cross: in that threshold of darkness and pain, did not fade or left, walked to be there. He walked to Tepeyac to accompany Juan Diego and continues walking the Continent when, through an image or stamp, a candle or a medal, a rosary or Ave Maria, enters a house, in a prison cell, in the ward of a hospital, in a nursing home, in a school, in a rehabilitation clinic ... to say: "Am I not here, that I am your mother?" (Nican Mopohua, 119). She, more than anyone, knew about commuter trains. She is a woman who walks with delicacy and tenderness of mother, is made to lodge in family life, unties one or another knot of the many wrongs that we manage to generate, and teaches us to stand in the midst of storms. In the school of Mary we learn to be on the way to get there where we have to be: standing and standing among so many lives that have lost or stolen hope. In Maria's school we learn to walk the neighborhood and the city not with slippers of magic solutions, instant answers and immediate effects; not by fantastic promises of a pseudo-progress that, little by little, only manages to usurp cultural and family identities, and to empty that vital fabric that has sustained our peoples, and this with the pretentious intention of establishing a unique and uniform thinking. In the school of Mary we learn to walk the city and we nourish our hearts with the multicultural wealth that inhabits the Continent; when we are able to listen to that recondite heart that beats in our villages and that keeps-like a small fire under apparent ashes-the meaning of God and its transcendence, the sacredness of life, respect for creation, bonds of solidarity, joy of the art of living well and the ability to be happy and celebrate without conditions, there we come to understand what is deep America (see Encounter with the Steering Committee of CELAM, Colombia, September 7, 2017). Mary walks carrying the joy of who sings the wonders that God has done with the smallness of his servant. In her wake, as a good Mother, she provokes the singing by giving voice to so many who in one way or another felt that they could not sing. He gives the word to John - who jumps in his mother's womb -, gives the word to Isabel - who begins to bless -, the old Simeon - and makes him prophesy and dream -, teaches the Word to babble his first words . In Maria's school we learn that her life is marked not by the protagonism but by the ability to make others protagonists. It gives courage, teaches to speak and above all encourages to live the audacity of faith and hope. In this way she becomes transparency of the face of the Lord who shows his power inviting to participate and summons in the construction of his living temple. He did it with the indie Juan Diego and with so many others who, taking them out of anonymity, gave them a voice, made them know their face and history and made them protagonists of this, our salvation story. The Lord does not seek selfish applause or worldly admiration. His glory lies in making his children protagonists of creation. With the heart of a mother, she seeks to raise and dignify all those who, for different reasons and circumstances, were immersed in abandonment and oblivion. In Maria's school we learn the protagonism that does not need to humiliate, mistreat, discredit or make fun of others to feel valuable or important; that does not resort to physical or psychological violence to feel safe or protected. It is the leading role that is not afraid of tenderness and caress, and that knows that its best face is service. In his school we learn authentic protagonism, dignify all who are fallen and do it with the omnipotent force of divine love, which is the irresistible force of his promise of mercy. In Mary, the Lord denies the temptation to give prominence to the force of intimidation and power, to the cry of the strongest or to assert itself based on lies and manipulation. With Mary, the Lord guards the believers so that their hearts are not hardened and they can constantly know the renewed and renewing strength of solidarity, capable of listening to the beat of God in the hearts of the men and women of our peoples. María, "pedagogue of the gospel", walked and sang our Continent and, thus, the Guadalupana is not only remembered as indigenous, Spanish, Hispanic or African-American. It is simply Latin American: Mother of a fertile and generous land in which all, in one way or another, we can find ourselves playing a leading role in the construction of the Holy Temple of the family of God. Son and Latin American brother, without fear, sing and walk as your Mother did.